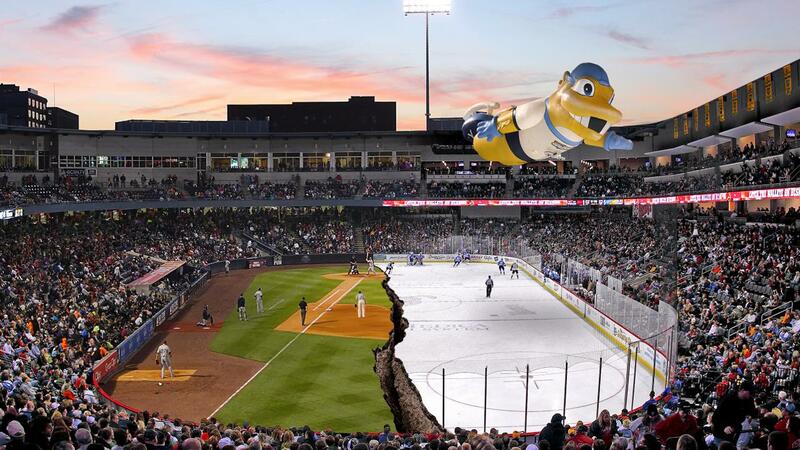 There's nothing like enjoying some baseball action at Fifth Third Field and taking in a hockey game at the Huntington Center, all in the same day! The Mud Hens and Walleye are both in action on Saturday, April 6, and a T-Town Doubleheader ticket will get you into both games! • Field Level Ticket: Toledo Mud Hens vs. Louisville at 5:05 p.m.
• Standing Room Only Ticket: Toledo Walley vs. Brampton at 7:15 p.m.
• Field Level Ticket:Toledo Mud Hens vs. Louisville at 5:05 p.m.
• Standing Room Only Ticket: Toledo Walleye vs. Brampton at 7:15 p.m.
• Fleetwood's Tap Room: fleetwoodshensville.com | Fleetwood's Tap Room is a lively social hall in downtown Toledo's Warehouse District. We proudly pour 48 craft beers, including local flavors brewed right here in the 419. • Holy Toledo! Tavern: holytoledohensville.com | Holy Toledo! Tavern combines Toledo's rich history and warm hospitality while providing a fun gathering place for people who live, work, play, and visit downtown. Holy Toledo! Tavern captures the local flavor of our city and offer a fresh approach to casual dining.